It was Thursday evening. As 9 p.m. neared and the sound system was tested, a buzz rippled through the growing crowd in the Multi-Purpose Hall. The President’s Town Hall was about to begin. President Pericles Lewis began his presentation by announcing updates on the upcoming campus. One by one, his slides flashed pictures of the existing state of various locations in the new campus and their corresponding artist’s impressions. These included the dining hall, lecture theatres, classrooms, sky gardens, residential towers, residential rooms and the main college gateway. The movement of the college to its permanent campus across the road will commence in 2015. Unfortunately, the stop work order enforced on the construction site due to the Dengue outbreak in August coupled with a tight labor market has delayed progress on the site. As a result, students may only expect to move in from mid-May 2015. Lewis added that other campus facilities such as the dance studios and the black box theater should be ready by July 2015 for Fall semester classes. Although the new residential buildings will no longer have common lounges on every floor, there will be open-air sky gardens on each level that will continue to serve as common spaces. Other common spaces in the residential buildings will include shared living spaces in suites and possibly the roof tops, according to Lewis. 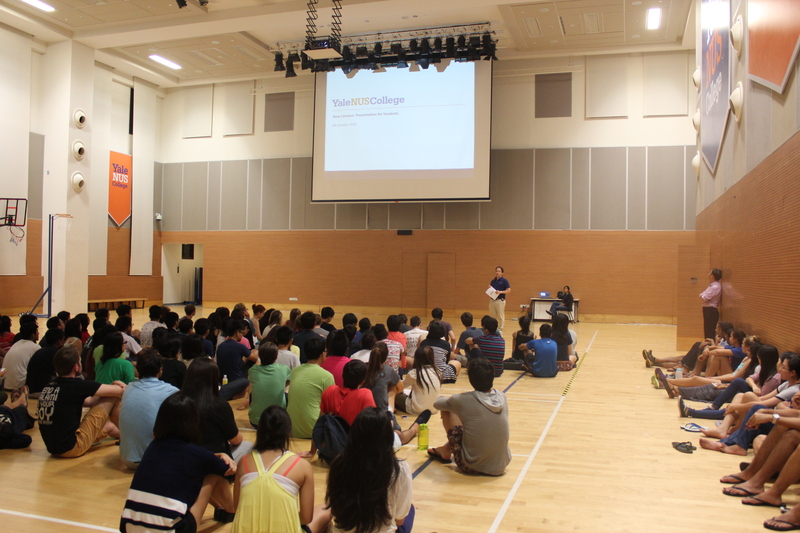 During the Question and Answer section, some students raised concerns about the degree of access NUS and Yale-NUS students will have to the respective campuses. “I’m concerned that should we restrict NUS students’ access to our facilities, we will lose some of the convenience of being close to Utown, for instance … the study spaces [there],” said Feroz Khan ’18. Others wondered if having a new campus will make it easier for performance groups to book venues for practices. “[The] dance community in both NUS and Yale-NUS is vibrant so naturally, there is competition for space. [In Utown], priority is understandably given to NUS dance groups so we do look forward to having a space that we can call our own,” said Jocelyn Lim ’17. Students who have ideas for various campus spaces should approach their respective Rectors. “Presently, the rectors’ offices have a budget for an array of activities that support community building … As a community, we can decide to go to the theater, bring in a local luminary for a conversation, support the campus workers (cleaning staff, construction, etc. ), buy an Xbox for the commons room, or have a nice dinner,” shared Rector of Elm College Brian McAdoo. The new residential college buildings will host two to three suites on each level. Each suite is home to six students and includes a shared bathroom and living space. Students can also look forward to a buttery and a pool table in every RC.